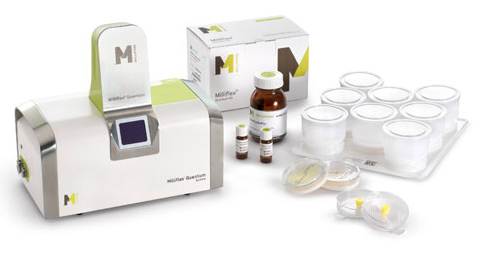 Millipore Corporation, a leading provider of technologies, tools and services for the global life science industry, announced the launch of its new Milliflex® Quantum rapid microbial detection system. The system enables drug and vaccine manufacturers to respond to microorganism contamination earlier in the production process. "The Milliflex Quantum system provides results faster than traditional testing methods. It is designed to significantly improve product quality management, helping customers to release product to the market sooner and avoid line shutdowns," said Roland Heinrich, Ph.D., Vice President for Process Monitoring in Millipore’s Bioprocess Division. "The system is based on two widely adopted technologies – membrane filtration, performed with proven Milliflex membrane filtration devices, and fluorescent staining – to ensure consistent, reliable results," Heinrich continued. "In addition, the validation process is streamlined because it involves only minimal changes to the compendial tests currently used." The Milliflex Quantum system is ideal for testing raw material, in-process samples, final product and environmental samples. It is non-destructive, an important feature that enables operators to grow microorganisms in order to identify them with standard ID technology. The majority of rapid test systems are destructive in nature, which means they offer limited capabilities for microorganism investigation and identification. The Milliflex Quantum system consists of a reader, camera and fluorescent reagents used in combination with the Milliflex PLUS pump, Milliflex filtration devices and media cassettes. It is compact and easy to learn, for smooth integration into an existing laboratory set-up. Millipore offers a comprehensive range of services to support the system’s implementation, including installation, operational and performance qualification guidelines. "This innovative new system extends Millipore's rapid microbial detection portfolio, which includes the recently launched MilliPROBE® detection system for mycoplasma," Heinrich noted. "The simple two- to three-step method ensures accurate microbiological results, while reducing overall time to result."